Artur Ressel was born in the Northern Bohemian village of Gablonz and lived and worked in Agentendorf in the Prussian province of Lower Silensia. His portraits recall the spirit of Neue Sachlicheit (New Objectivity), a style which emerged in Germany in the 1920s as a challenge to Expressionism. As its name suggests, it offered a return to unsentimental reality and a focus on the objective world, as opposed to the more abstract, romantic, or idealistic tendencies of Expressionism. The style is most often associated with portraiture, and its leading practitioners included Christian Schad, Otto Dix and George Grosz. Their mercilessly naturalistic depictions, sometimes reminiscent of the meticulous skill of Old Masters, frequently portrayed Weimar society in a caustically satirical manner. Although Ressel’s sober realism betrays affinity to the representational style of New Obejectivity, his work also reflects the Romantic spirit of German folk art. He avoids much of the subtle distortion and accentuations influenced by the Expressionists. Isolde contains little of the aloof perspective or sleek, metallic lack of warmth that are the visual hallmarks of New Objectivity, and none of its satirical hyperrealism is to be found. Combining objectivity and sensitivity, Ressel’s intimate portrait reflects a realism which draws consciously upon earlier prototypes and is deeply rooted in the tradition of the late nineteenth century, but also in the study of Old Masters. Indeed, this Renaissance style portrait of the artist’s daughter, with its severe profile format, recalls those of earlier Italian artists such as Domenico Ghirlandaio (fig. 1) and Sandro Botticelli. In contemporary terms, Ressel’s Isoldeis comparable to the haunted painting Portrait of Boy (1928) by Kurt Gunther (fig. 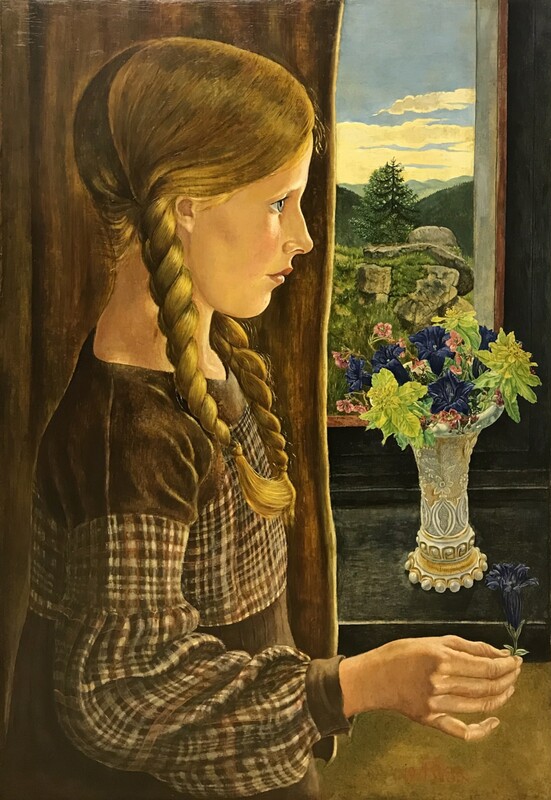 2) and Sergius Pauser’s Girl in Blue Dress(fig. 3). All three of thesebportraits employ a stylistic approach that combines an “objective” idea of life with a slightly surreal and mysterious quality. The sitter holds a Gentiana acaulís, a short stemmed blue Alpine flower native to central Europe.